How To Build An Online Boutique From Scratch? One question I've encountered several times in the last few months has been how to build an online business from scratch. It's both complicated and exhausting if you don't know have the means and the resources to get started. So if you someone, who has ideas for online business but lack the how-tos or confused about what kind of business to start you are the right place. 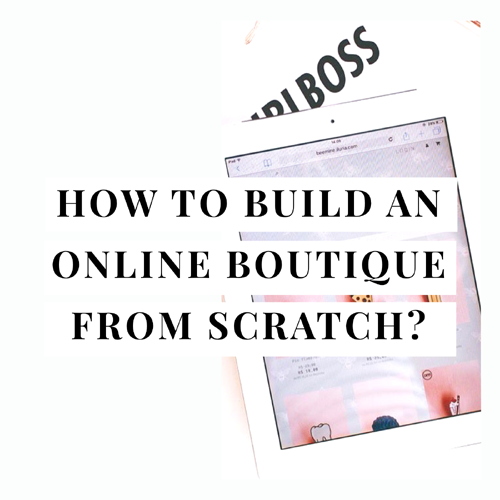 In this blog, I'm going to talk about steps you can take as a newbie to build an Online Boutique from scratch. Even though it's extremely difficult to summon the whole process in one blog, I decided to give you a little kick start with 2 main steps of getting started. I know it sounds cliche but first things first, you've got to decide what you want to sell. Are you good at making something? Candles, Jewelry, art, and sculptures? Or Maybe you have great knowledge about home decors or fitness equipment? There are a lot of options to get started. You can also look at 11 Online Boutique Ideas on the website to brainstorm your way into getting started! Once you have your Boutique niche sorted, it's time to find the suppliers. When it comes to starting an Online Boutique, suppliers also play just as important a role as the niche itself. This is because you don't want a supplier that has (1) lower quality products or (2) poor customer service that gets reflected on to your customers as well. Therefore be very choosy when it comes to who you want to work with. + Dropshippers - Dropshipping is a new way of selling online. These suppliers allow you to sell their products without holding any inventory or investing hundreds and thousands of dollars into getting started. You only buy the product after your customer has purchased from you. + Manufacturers - If you have a unique idea, you can look for a manufacturer who would make the product for you. + Wholesalers - Buying from a wholesaler is one of the easiest ways to acquire a product. It not only gives you an option to re-sell them at a higher price but also lets you add your branding to it. + Make products - If you an artistic person, good with handy crafts and making things, you can always make products to sell. Pat yourself! You have the 2 main elements required for setting up an Online Boutique! Next step is to set up an online store to display your products to your potential customers. + You can use online marketplaces like Etsy, eBay, Amazon, Inktale and so on. P.S. If you worried about creating your own website and not being techy, don't worry. There are a lot of pre-made e-commerce themes available on the internet that you can use to set up your store. Ready to start your Online Boutique? Snag the "Online Boutique Launch Checklist" FREE simply by adding your details below! I Want To Start A Boutique, But Am Afraid It Will Be Too Expensive.